As Project Manager for Multicultural Children’s Book Day, one of the big things I am working on this week is spreading the word on the MCBD Twitter Party on 1/27/17 (9:00-10:00p.m. ET). This will be our 4th Twitter Party and they are INSANELY fun and fast-paced! What I have noticed during these planning stages is that were many Twitter Party newbies asking how to Participate in a Twitter Party so I decided to shed some light on the subject so that no one will feel too intimidated to join us. First, what IS a Twitter Party? A Twitter Party is a live chat using Twitter and the Hashtag(#) to connect to participants, thus connecting to the conversation stream. As a participant, you should follow the appropriate hashtag (for MCBD, it’s #ReadYourWorld) and engage with other party-goers, discover new and interesting factoids and even a little more about the brand or organization the party is supporting (in this case; MCBD). For those unfamiliar with Twitter, I found something very interesting called Tweet Chat. TC is free to use and seemingly isolates the conversation occurring to just the hashtag you plug in where it says “Hashtag to follow.” Once you do that, and sign in with your Twitter account, you’ll be able to read everything everyone is saying at the party (it will automatically group together all the tweets so it is easier to follow and if you want to say something during the party. PLUS it says it will automatically put in the hashtag for you! I LOVE that part. I have not tested Tweet Chat yet, but it looks super cool and super easy to use. OK, back the “whys” and the “hows” of Twitter Parties. A Twitter Party generally has one or more hosts who post about the event ahead of time (that would be ME, and co-founders Valarie Budayr and Mia Wenjen) and who invite their followers/supporters by spreading the word via various social media outlets. The host(s) of the Twitter Party will inform participants people what the Hashtag(#) will be ahead of time, along with what the prizes will be, in a blog post announcing the party. Like I mentioned before, the hashtag to watch for and follow is #readyourworld. Most often Twitter Parties have sponsors who provide prizing to randomly selected participants. For MCBD, many, many multicultural book authors and Sponsors donated books to give away during this event. Winners are usually selected by one of the hosts running the event. In this case, most of the twelve book bundles will be shipped by us but sometimes the Twitter Party sponsors will step in to ship prizing directly to the winners afterwards. During the Twitter Party (1/27 at 9:00p.m ET or 8:00p.m. Central) one of the hosts will randomly choose winners of the book bundles and announce the winner (via Twitter Handle) during the party. The winner will be asked to DM (direct message) MCBD on Twitter to share their address so we can ship their goodies. REMEMBER, the more you participate, the more likely you are to win something! Why is it a great opportunity? A big plus for both brands, authors, publishers AND participants and it also gives them a whole new pool of like-minded peeps to follow! In our case, if you are an multicultural children’s book author or publishing house, it can be a very fun way to connect and get in front of your end user (the buyers of your books). For participants, I promise you’ll have fun, learn new things and meet new friends and you might even win a great prize! By the way, anyone can join any Twitter Party… they are completely free and open to the public as long as you have a Twitter account (which is free to set up). How do you “talk” during a Twitter Party? This is where your “reply” arrow will come in handy. If you see a question or comment you would like to respond to, click the arrow that points left (green arrow in the screenshotbelow). If you want to retweet a link or a resource that someone shared, use the Retweet arrows (the blue arrow in the screenshot). One notable thing about Twitter Parties is they move crazy-fast! It can sometimes be hard to keep up with and that hour will be gone before you know it! It can be very helpful to use a website such as twubs.com or tweetchat.com that helps you follow the hashtag Twitter Stream and allows you to pause/resume the flow. Another way to use TweetDeck or HootSuite with multiple columns set up for the party host(s) and the hashtag. That’s how I’ve done it in the past, but this year, I think I will try Tweet Chat. The MCBD Twitter Party will be a great chance for participants to discover new diverse children’s books, have awesome book discussions and Win 1 of 12 Book Bundles! Basically we are giving away Book Bundles every 6 minutes! That’s over 100 multicultural kids’a and YA books! You can view all of the book bundles HERE. We will be discussing the state of children’s book publishing and giving away diversity book bundles every six minutes! We invite EVERYONE to join us: authors, publishers, parents, caregivers, librarians, KidLit lovers. You don’t have to be an author or publisher sponsor to join us! Let’s talk about our favorite multicultural and diverse children’s books, authors, and illustrators! How do you join the Twitter party? Just use hashtag #ReadYourWorld to find us. When you tweet, use the hashtag so everyone can find you! Looking for Kindness Classroom books and activities for your students? 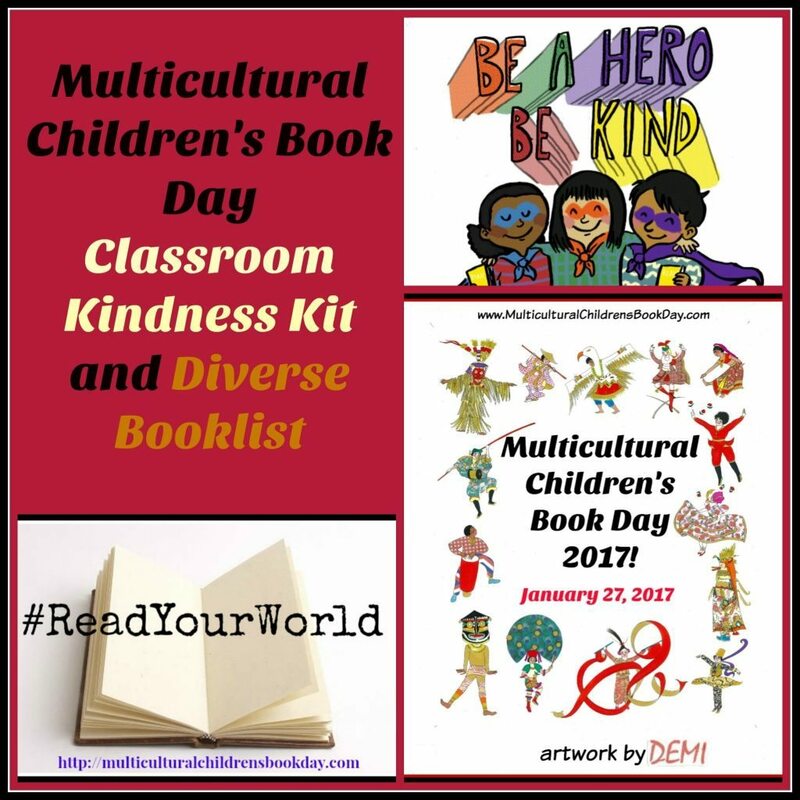 Multicultural Children’s Book Day’s Downloadable Kindness Classroom Kit for Educators, Caregivers and Homeschoolers is OUR gift to YOU. Go here to download and Be Kind, Be a Hero today! The #ReadYourWorld Twitter Party is Coming! Great Convos and the Chance to win Boatload of Diverse Kids’ Books! I get to be one of the CoHosts of Fabulousness for Multicultural Children’s Book Day 2017! And I meant to say..best of luck for your twitter party! =) They are fast and you need an IV of coffee to keep up sometimes. Haha. Previous Post The #ReadYourWorld Twitter Party is Coming! Great Convos and the Chance to win Boatload of Diverse Kids’ Books!